Our transition year students Tiarnan and Abigail spent one-week at the Carzone office. In this time, they learned about the different areas of the business. 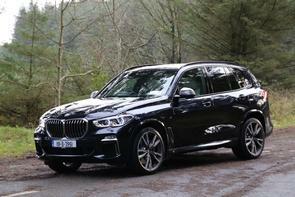 We took them for a drive in this weeks test car, the All-New BMW X5 and asked them to review it, here's what they thought. The new BMW X5 is one of the largest and most-popular SUVs in the BMW X family. The BMW X5 has a large exterior and has a noticeable BMW design. It has a large one-piece kidney grille and 22-inch light alloy wheels. The colour is dark black with a hint of blue elements. Inside the new X5 is very comfortable with creamy leather seats and it has a panoramic glass sunroof. There is lots of space for a family to be comfortable and the lower and upper sections of the split boot can be opened and closed electrically. There is also very advanced technology in the new X5; some of the ones we liked were the seat warmers, gesture control, assistant voice control, navigation, a 12.3-inch infotainment system and digital instrument display. The BMW X5 offers a gentle ride, especially through outdoor plains and it has an M Performance TwinPower Turbo inline 6-cylinder diesel engine and Adaptive M Suspension Professional. It is very exciting and has a thrilling speed as well as manoeuvring well around corners. Very compatible and well-made vehicle, great for a family of five and it is especially great for any field trips or holidays and is well worth the price. To conclude, the BMW X5 is a great car, with high tech and perfect comfort wherever you go. It is quite fast, like an SUV in many ways. It’s very safe and family-friendly, just quite pricey depending on the tech you choose to add, but besides that, it’s a very charming car!